Have you ever mixed up your bread dough, and then forgotten about it? I just did that. It rose and rose, and by the time I looked at again, it was not going to rise again. Instead of throwing it out to the chickens, I decided to try for some cinnamon rolls. 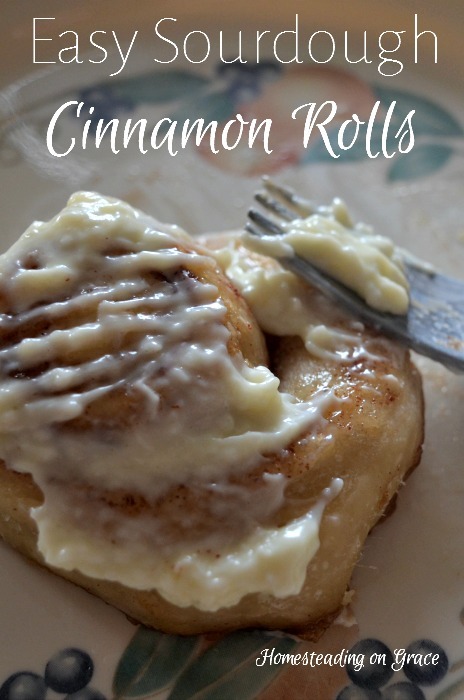 It's just that time of year when I need to eat all the calories (my body does not like the idea of possibly getting cold), so I've been craving cinnamon rolls and everything else under the sun that is sweet and delicious and warm. These sourdough cinnamon rolls satisfied the cravings without hurting my health too much because they really didn't have that much sugar in them. Gideon decided to be my photographer. And well, he just put a lot of me in the pictures. I had on my pjs (it was morning!) and I had on a brace for diastasis recti. Not my best look, let me tell you! So I cropped myself out of these pictures, but they aren't the best. Now sprinkle the dough with cinnamon. And then sprinkle with a good amount of brown sugar. Then start rolling the wide side of the rectangle up. You can use the handy dough cutter to scrape it off the counter. Once the dough is rolled up, use the cutter to cut about 1 inch thick rolls. Place the rolls in the prepared pans, and then do it all again with the other half. Bake at 400 for 20 minutes. While they are baking, make a glaze. We did a cream cheese glaze because I like cream cheese glazes (and it was more of an spread than a glaze, and I didn't whip it until it was smooth). I just whipped together a brick of cream cheese, some sugar to taste, and some vanilla. If you'd like more of a glaze, you can add milk to thin it. Spread your glaze or icing on the rolls once they finish baking, and serve! They were delicious, and not too sweet. And it's so versatile since you add more or less depending on your tastes. I like easy and versatile. Following a recipe stresses me out most of the time. Wow! These look amazing. Definitely adding to my list of recipes to try! How cute is that chubby little toddler hand sneaking in there lol. These look so delicious! Thanks for sharing your recipe on the Homesteader Hop. I know, I love that picture with that little hand! She's so cute. You can also make Monkey Balls or Pull Aparts - just roll the dough into ping pong size balls, dip into melted butter, then cinnamon sugar. (Dod another rise before baking) Bake in a loaf or ring pan. You can either glaze the whole thing or use the glaze for dip. Oh good idea! My kids and I thank you! I love that these are made of healthier sourdough. 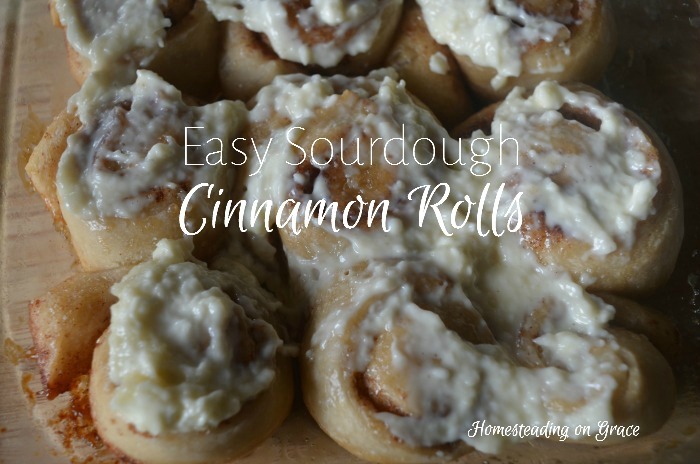 Your Cinnamon Rolls look so good and I'm so glad you shared them with us at Hearth and Soul. Pinned! Hope to 'see' you again this week - the hop is open now!